Henning Larsen Architects are designing a new train station for the Danish city was not built yet! Archi-new - Free Dwg file Blocks Cad autocad architecture. Archi-new 3D Dwg - Free Dwg file Blocks Cad autocad architecture.  Home › news › Henning Larsen Architects are designing a new train station for the Danish city was not built yet! Henning Larsen Architects are designing a new train station for the Danish city was not built yet! Danish architect Henning Larsen Architects Office gain a contract to design a train station in the new city Vaing Vinge located in the rural area outside Copenhagen. 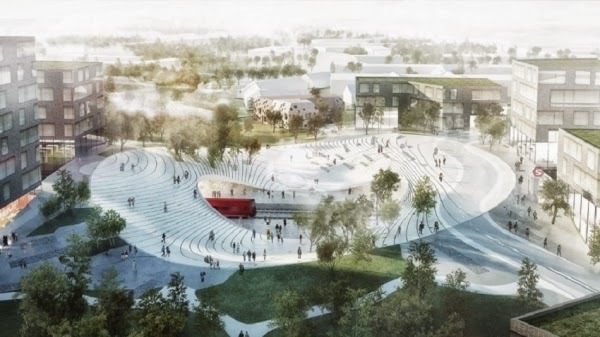 Larsen has won the architectural competition to design the S train station which will form the main transport node in the city center of Al350 hectares that will be built in Frederikssund province north of Copenhagen. Will train the new city and regional areas neighboring station in addition to Copenhagen, is expected to be built by 2017, before the city is completed in 2033. Architectural office designed master plan for the city, which will be the largest urban development in Denmark to date, the project, and will be a place to live 20 thousand inhabitants. Henning Larsen said, "will increase the viability of the easy access to the city by public transport Vaing public appeal which will encourage the establishment of businesses in the city or in the north of the center of the business district center completely." The station building in the design as well as it seems gash under natural ground level with an elliptical slot, where Singams create a white roof to meet my podium level and rises to the nail above the rail, forming a bridge on both sides of the slot. As terraces surround Balanchae to provide recreation area leading to the nearby public park with a railway train stretching toward channels between the buildings on both sides of the station. "Extends the space and urban landscape and opened their Itlakien the area in front of the railway, which ensures that the railway does not divide the city into two parts." According to the architects. Thus deliberately Architects building buildings along the rail of different heights in order to integrate the station within the big city infrastructure. "Starting from the high-density environment of the city center architecture Taatdrigaa transmitted to the lowest forms of the buildings and the most open and decreasing scale building blocks end Ballandskyb and open ocean." In the words of architects. The station will be put on the ends of a long strip of land that extends the park across the city center which is a connection between the city and the rural environment.